Founded in the 1930s in Los Angeles, the Branch Davidian Seventh Day Adventists were mostly unheard of until 1993 when they made front-page news all over the world. The group moved to Mount Carmel, 14.5 km (9 mi) from Waco, Texas. In 1990 they appointed a new leader, Vernon Wayne Howell, aka David Koresh. Two years later, the Bureau of Alcohol, Tobacco and Firearms (BATF) was informed by Chief Deputy Daniel Weyenberg of the McLennan County Sheriff’s Department that weaponry and explosives were being sent to Mount Carmel through UPS. At 9.30am on 28 February 1993 BATF tried to execute a search warrant on the premises but, as they did so, shots were fired. Four BATF agents —Steve Willis, Robert Williams, Todd McKeehan and Conway LeBleu — were killed and 16 wounded. As the first shots were unleashed, a Davidian dialled 911 and shouted, “That’s them shooting, that’s not us!” A cease fire was called at 11.30am but BATF spokesmen said that shots were fired intermittently throughout the day. Thus began a siege that lasted 51 days and involved the BAFT, Texas Rangers, local police, FBI and Justice Department. From time to time Koresh let some of his people leave the compound, although it was believed that they had enough food to last out a siege of at least a year. Demands to end the standoff increased. Some advocated cutting off power and water while others suggested more direct action. 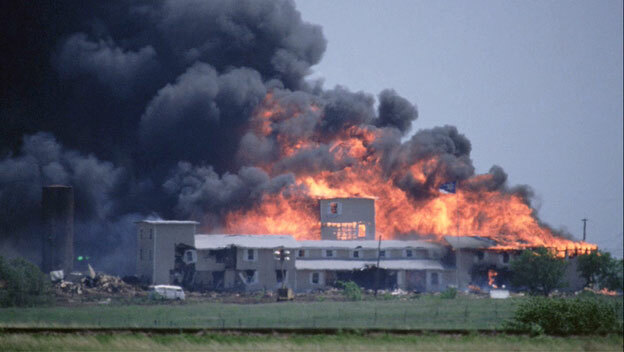 Loud music was played outside the Branch Davidian compound in a bid to force them to leave. After discussion within factions of the FBI, water and power supplies to Mount Carmel were cut. Koresh claimed that he and the Branch Davidians were awaiting the impending Second Coming of Christ and had been ordered to stay where they were. Fearing another Jonestown (search the article) mass suicide, Attorney-General Janet Reno allowed the FBI to mount an assault on the compound. It began just after 6am on 19 April 1993. CS gas was fired inside and met by shots from the Davidians. After six hours and much CS gas none of the Davidians had left. At 12.07pm flames were seen in the front of the building and then the fire spread quickly, engulfing the compound. All but nine people inside burned alive. David Koresh was pronounced dead at 3.45pm. Debate still continues as to who or what started the fires. Ten survivors of the fire were indicted by a federal grand jury. Eight Davidians were convicted on firearms charges. On 12 May 1993 Texas authorities bulldozed the site.